For several decades, I've noticed that most Christians, new or not, cannot define the basics of Christianity or explain what they believe. They know their job, their sports, their hobbies and pop culture but shrivel when confronted with communicating the basic concepts and principles of the faith they believe has saved them. 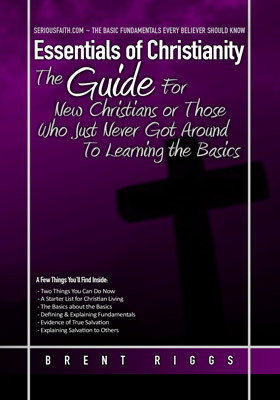 I decided that the best way to teach new, spiritually immature or Biblically uneducated Christians the essentials of the Christianity is to: •	Emphasize and illustrate the basics of Christianity •	Explain and define a list the foundational Christian concepts God has revealed in the Bible •	Give a "starter list" of some behavior, attitudes and practices you should be developing as part of the basic Christian life. This is a STARTING POINT for new Christians, or Christians who have never learned the basics. I created the illustration on the previous page to give you a visual of how all these concepts fit together. I have often found that Christians may be able to define these terms but cannot put the pieces of the puzzle together. Before we begin defining these fundamental terms, let me encourage you. The terms themselves may seem like a college course in theological vocabulary; however, these are as basic to Christianity as terms such as liability, income, asset, and profit are to an accountant. While discussion of any single term could fill a thousand-page volume, you will also find that these concepts are the basic building blocks of your faith and quite understandable for any Christian. I am giving you a basic definition and understanding in this section. Look back at the previous illustration and see how these topics fit into the overall view of God's plan for the salvation of humanity. Knowing these fundamentals will give you a solid foundation for your faith and belief, and will no doubt launch you into a lifelong discovery of God's Word. "Why?" is the greatest question you can answer to solidify your Christian conviction. Learning the following list of fundamentals answers a very long list of "why?" for the Believer in Christ. To repent is to not only be sorry for your sin but to make a purposeful decision to turn away from it and not sin anymore. Repentance is the planned effort to do whatever it takes to NOT sin. Repentance is true sorrow for offending God and violating His holiness, as evidenced by our contrition and actionable desire to stop sinning. Faith is focusing your trust on God and Jesus. Faith in God is not faith in our abilities or efforts - it is taking our eyes off ourselves and fixing them firmly on the Father and Son. Faith is the hope and trust that what God says in the Bible is true. Faith is obedience and commitment to God even when we cannot see, know, or understand. In essence, Faith is TRUSTING and FOCUSING on Jesus for our salvation. Substitution is Jesus Christ dying on the cross instead of us. God the Righteous Judge cannot ignore sin - and the penalty is death. Jesus, being perfect, took our place and was punished for our sin. He was our substitute and because He died for us, God's justice is satisfied and God can now accept you and I (sinners). God opposes us because He is perfect and holy, and we are sinful. God is AGAINST us because He is the Righteous Judge. Reconciliation is the process of bringing together two opposing parties. We are reconciled to God because Jesus was punished in our place, satisfying God's justice. God no longer opposes those who put their faith in Christ because Jesus did what was necessary to end God's opposition towards us (He took our penalty on Himself). Propitiation is a legal term that means to appease or gain divine favor. Jesus Christ satisfied the holiness of God on the cross by allowing His blood to be shed to appease God's righteous desire to punish sin. Propitiation is the fact that we are once again in God's favor because of the death and sacrifice of Jesus.